Location. 37° 38.191′ N, 77° 48.314′ W. Marker is near Goochland, Virginia, in Goochland County. 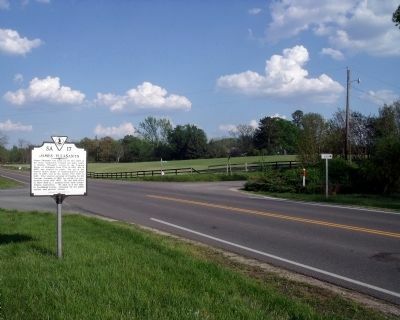 Marker is at the intersection of River Road West (Virginia Route 6) and Hunters Woods, on the right when traveling west on River Road West. Touch for map. Marker is in this post office area: Crozier VA 23039, United States of America. Touch for directions. 2. River Road West & Hunters Woods (facing east). (approx. 1.8 miles away); Dahlgren's Raid (approx. 2.2 miles away); Lee’s Last Bivouac (approx. 2.7 miles away); Lee's Last Camp (approx. 2.7 miles away); Lee's Final Bivouac (approx. 2.7 miles away); Sabot Hill (approx. 2.8 miles away); Shiloh Baptist Church (approx. 3.7 miles away); Michaux Grant (approx. 4.7 miles away). Touch for a list and map of all markers in Goochland. More. 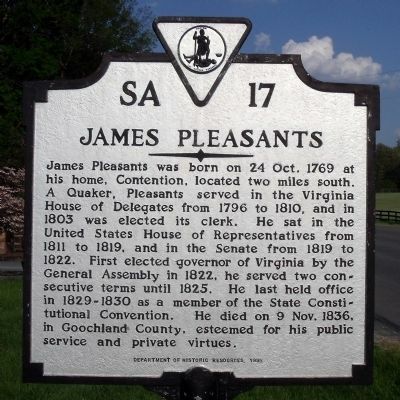 Search the internet for James Pleasants. Credits. This page was last revised on June 16, 2016. This page originally submitted on April 27, 2009, by Bernard Fisher of Mechanicsville, Virginia. This page has been viewed 1,159 times since then and 19 times this year. Photos: 1, 2. submitted on April 27, 2009, by Bernard Fisher of Mechanicsville, Virginia.